The blizzard arrived as promised. My trip to the grocery yesterday morning is vindicated. How could we possibly have gotten through this blizzard, without the extra 36 eggs I bought, along with noodles for some future tuna casserole? I don’t know why I got so crazy yesterday, except that I wasn’t the only one. I drove into the parking lot of the grocery store, and told my eldest child that I would only be a moment, as I was only going to buy one dozen eggs. I walked to the entrance of the store and saw that there were NO shopping carts outside. That meant that everyone in the county was inside that store, buying multiple items, and suddenly….one dozen eggs felt inadequate to save my family. I grabbed an over-the-arm basket, filled it to the shoulder-dislocating point, and waited endlessly in line. I staggered back to the car, triumphant. We had eggs for weeks. It was a two-dimensional trip: the flat plane of the parking lot and grocery aisles, the upright shoppers. I came home to the world of 3-D, when I went outside to fill the feeders. I am the birds’ shopping cart, and I was determined that they would never face the same situation I just had: no cart to fill before the storm. I poured black-oiled sunflower seed into the “squirrel-buster” feeder. I emptied the questionable, leftover thistle feed from the second feeder onto the brown hillside, and filled it with fresh, dry, worthy thistle seed for the finches. I took a square of frozen fat (skimmed from our Christmas turkey drippings, poured into a loaf pan and frozen) and slipped it into the suet feeder for the woodpeckers and the chickadees, and as it turned out, a visiting flock of starlings. Even before I was inside, the birds were wheeling overhead, zooming in and out to feed (this is the 3-D part). Their frantic pace told me even more clearly than zero-shopping carts, that a storm was coming. 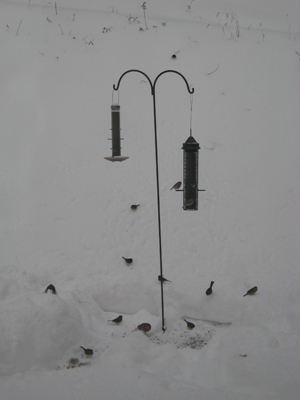 Who needs breathless weather forecasters, when you have focused flight at the feeder? I stepped aside quickly, to allow full access. The birds fed all afternoon. Before night fell, I refilled the feeder. 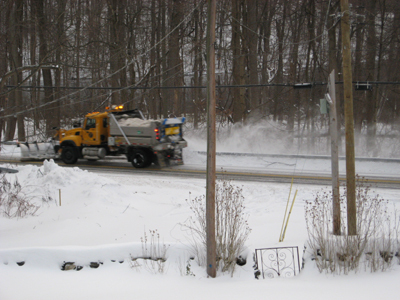 The snow began, as blizzards often do, with tiny bits of sharp biting flakes. The air grew blurry, and the brown ground disappeared. This morning there was two feet of snow on the ground, and the wind had covered one side of the feeders with driven snow. 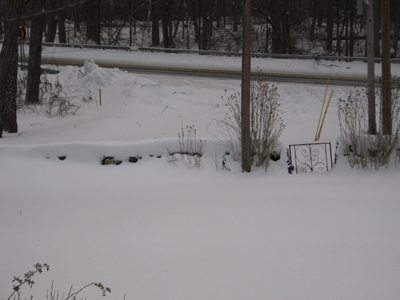 I pulled on my snowboots, and went outside, still in my bathrobe, probably looking like the Madwoman of Westchester. I shoveled a path to the feeder, and brushed the snow off the feeders. 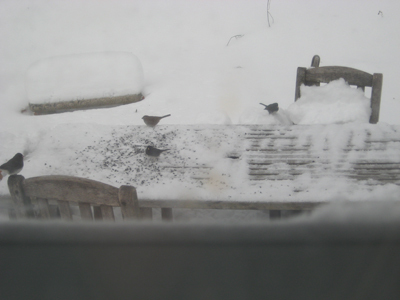 I shoveled the ground beneath the feeders, so that the juncoes and sparrows would have their table accessible. I brushed the snow off of the picnic table, and tried to press as much snow as possible between the slats, creating yet another table for the ground feeders — lofty dining. 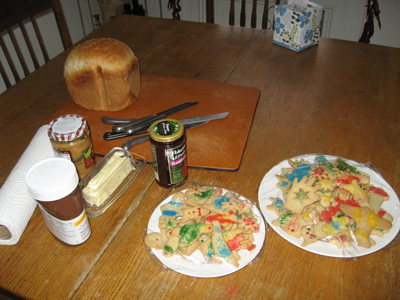 Fresh baked bread and Christmas cookies: breakfast of champions! 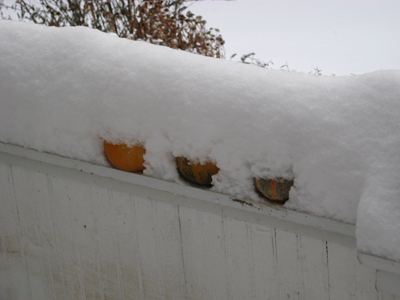 I forgot to remove our harvest pumpkins from the porch railing. In the spring, maybe. All that is left of our stone wall. Minus the cardinals and bluejays, the colors are muted. The welcome sound of blade on asphalt! We still have power, and so the snow is beautiful, in every dimension. Is that a jar of Nutella I spy on your table??? YUM is it is!!! I have my saddlebag thighs because I can’t control myself around the stuff! Your pics are making me jealous–we were completely missed by that storm. Sigh. And as I keep rambling—-cut open a pumpkin and leave the halves out—the birds will peck at it! It IS Nutella! And I agree, a breakfast of hot chocolate, bread and nutella is not to be resisted in any way. I’m sorry if you are sorry to be missed by the storm. Where do you live? I’m assuming more inland than me — we’re in Westchester County — Yorktown Heights. Often the storms swing east of us, pummeling Long Island and the coast of Connecticut. And thank you so much for the tip about the pumpkins. I am going out right now to see if I can free them from the front porch, and move them out back for the birds. If I’m successful, I will take photos and post!